Description: 315,000 Lbs./Hr. Nebraska Boiler Steam Plant, 250 PSI Design Pressure, Natural Gas Fired, complete with DA Tank, Water Treatment, and Feed Water Pumps. Includes: Three (3) 80,000 Lb/Hr. Nebraska Boilers, Model NS-F-72, Water Tube Boilers, Design Pressure: 250 PSI, Year 1998. Natural Gas Fired, Coen DFL-600 Burners, Boiler Surface Sq.Ft. : 6,474 / Each. Includes ERI Economizer, Stack, FD Fan and Motor. Boiler Design Capacity: 100,000 Lbs/Hr. is limited by Burner / Fan size to 80,000 Lb/Hr. All Available Drawings and Engineering Included. 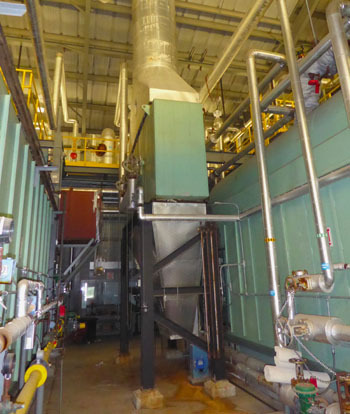 Additional 74,500 Lb/Hr, 250 PSI Nebraska Boiler available separately or included with this plant at the same location, with separate DA Tank and Feedwater Pumps. All boilers are available separately or in a package.